Keyforge is now at Millennium Games | Millennium Games | Over 1,000 Games! Want to try the hottest new card game by renowned designer Richard Garfield, creator of Magic: the Gathering, King of Tokyo and Robo Rally? Then it’s time to try out KeyForge! Leading their diverse teams, filled with followers from three of the Crucible’s great Houses, the players must gather Æmber, stave off their opponent’s progress, and ultimately be the first to open a Vault and gain its incredible knowledge. To open the Vault, players need to forge 3 Keys, costing 6 Æmber each. With a vast array of creatures, artifacts, and abilities and over 104 quadrillion possible decks, every deck is completely one-of-a-kind, and no two battles will ever be the same! KeyForge is a card game like no other, because every deck is unique. Whenever you buy a one of the $9.99 KeyForge decks, you are all set to play the game. If your friends are playing, you can pick up 1 deck and be all set, or you can grab multiple decks to try and open a better set of cards. Each deck will contain 3 different factions, with 12 cards in each faction. There is no modifying each deck, the cards you open are locked into that deck forever. This means there is no hunting for $30 single cards or trying to maximize your trade value to finish your deck, just open a box and play! 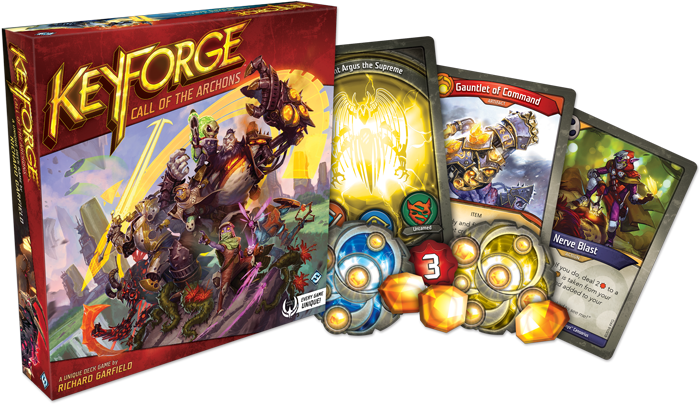 Millennium Games has single decks of KeyForge available for $9.99 each, or you can grab a box of 12 decks for $99.99 – you get two decks for free! We also have all the accessories you need for the game like sleeves, play mats, and event Millennium Games exclusive token sets, to make your game play even more impressive. Be notified of new posts.